Washington County, Beaverton note opening of Family Justice Center earlier this year; it shares a location with the older Domestic Violence Resource Center. Police and citizen advocates hope that new services in a new location will help boost public support in Washington County during Domestic Violence Awareness Month. 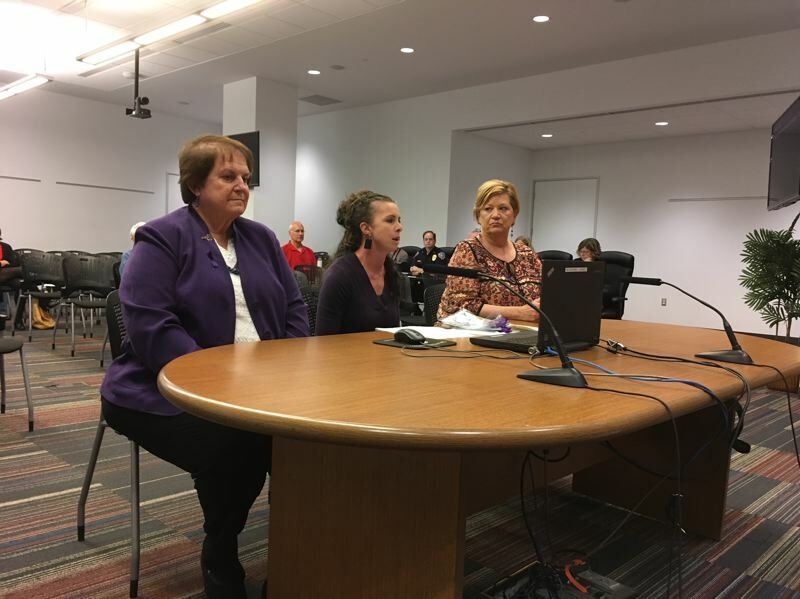 As county commissioners and the Beaverton City Council approved proclamations for October, officials talked about the opening earlier this year of the Family Justice Center, which is housed in Beaverton with the Domestic Violence Resource Center. Both work with the Washington County Sheriff's Office and city police to help survivors of domestic violence. "Domestic violence remains a plague on public safety and public health," Sheriff Pat Garrett said. "But we are fortunate to work in a community that has partners working together to solve problems, including this problem." A candlelight vigil for victims and survivors of domestic violence is scheduled from 5 to 8 p.m. Tuesday, Oct. 9, on the steps of the Washington County Courthouse in Hillsboro. The Family Justice Center opened March 26. It offers counseling and other support services for survivors. The Domestic Violence Resource Center, which traces its roots back about four decades, offers help with restraining and protective orders and operates the Hillsboro shelter known as Monika's House. "It has become a collaborative community effort," said Rosemary "Rowie" Taylor, executive director of the Domestic Violence Resource Center. "Beaverton is a great example of everything working together. I remember that 30 years ago, we were talking about the concept of one-stop shopping, so that people wouldn't have to tell their story 10 times. "The situation has definitely changed. Domestic violence still exists. But I think people are aware there are more services available." When the Family Justice Center opened, it completed that one-stop concept, especially for survivors — particularly women, who constitute a majority — who already have limited means of escaping abusive situations. "Try to find services to escape a scenario like this when you have no money of your own and no wheels, and two small kids," Hillsboro Police Chief Lee Dobrowolski, who leads the justice center's board, said earlier this year. "What we are trying to do is put all of these services in one place." Washington County has a sheriff's team — a lieutenant, corporal and eight deputies — focused on domestic violence. Beaverton and Hillsboro police have volunteer teams of advocates to help survivors, and there is also a victim assistance program in the Washington County District Attorney's Office. "If the police respond to an incident that occurs, we can refer people to one place to receive all their services," said Katrina Rodriguez, victim service coordinator for Beaverton police. "So it simplifies the process for people who are already in complicated situations." 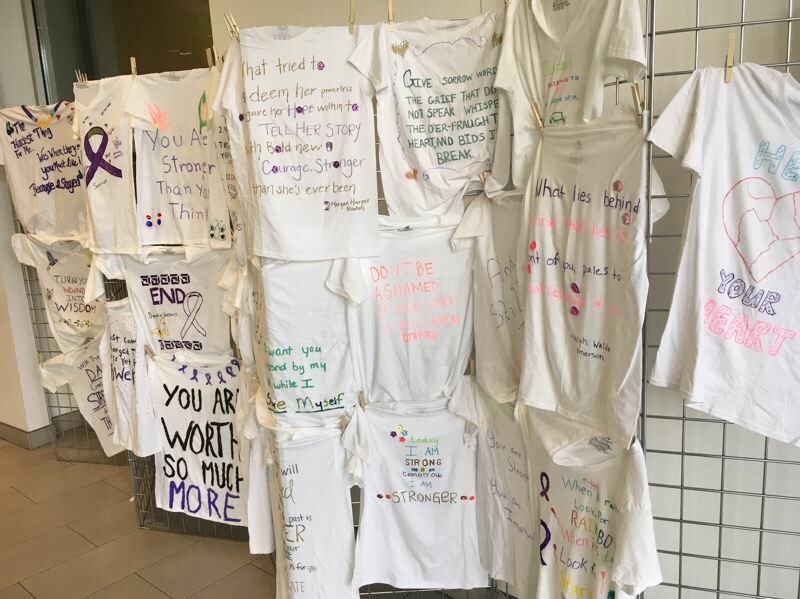 Beaverton City Hall has a display of T-shirts, modeled on the Clothesline Project, that were created by survivors at Monika's House, advocates at the Domestic Violence Resource Center and volunteers for Beaverton police. 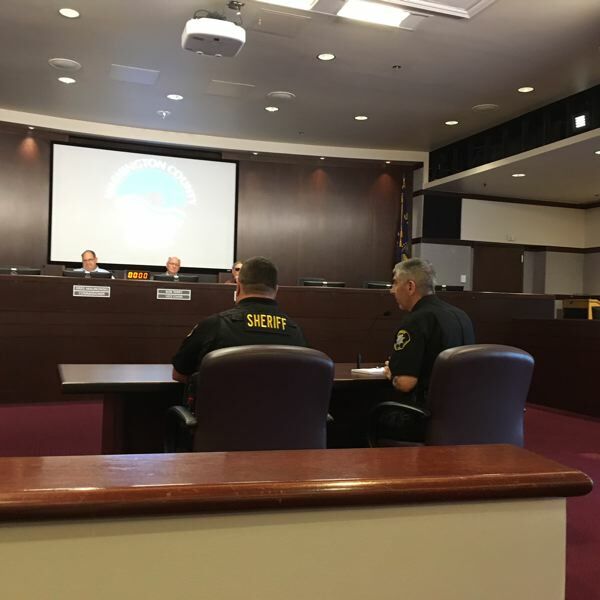 Rodriguez, during an Oct. 2 presentation to the Beaverton council, said there have been 6,800 reports of domestic disturbances in Washington County so far this year. Nationally, she said, violence between intimate partners accounts for 15 percent of all violent crimes — and 19 percent of domestic violence incidents involve the use of a weapon. "Domestic violence spans every section of society. There is nothing special in socioeconomic status, gender, race, religion — it is across the board," said Lt. John Bennett, who leads the Washington County sheriff's domestic violence team. "I think it is getting better with things like we are doing. We are bringing awareness to this issue. It's not a secret anymore. It's good for victims to know this is not their fault. We are here to help them and support them." Toni Loch, executive director of the Family Justice Center, said efforts also should focus on the effects of domestic violence on children. "The children are learning how to become victims and abusers by being in the homes where that (violence) abounds," Loch said. "So we really have to focus on those efforts." Beaverton City Councilor Cate Arnold described the time years ago when as a young girl, her grandmother would tell her about someone in the neighborhood who endured physical abuse from an alcoholic spouse — but no one would say so openly. "We have come a long way since then. That is no longer accepted by anyone," Arnold said. "Yet we still have a long way to go. It's still difficult to come forward as a victim."